Sarria is actually lucky to get a mention here, and it does so mainly because it is on the route that takes you from the city of Lugo to Samos. Samos has a large and famous monastery. This is one of my less factual and more rambling guides, so be warned! We did not so much visit Sarria, as use it as a port of call. We had spent the day in Lugo and, after visiting the Castro de Viladonga, decided to head off to Samos's famous monastery. Below, the main street that runs pretty much from one end of Sarria to the other, it has no hidden treasures or historic buildings. Lugo's tourist office had told us that the journey to Samos was short and, as a result, it was late in the evening when we set off. We initially passed through Sarria and the only reason we noticed it at all was because it was the only large scale town on our route. The journey by the way, whilst short in distance, was long in time and when we reached Sarria on the return leg we were in desperate need of food and drink – in fact we were no different to all the other pilgrims who take this route – although we had a car, fresh clothes, money, in fact forget that analogy. Our first clue to the fact that Sarria had more to it than initially met the eye came as we re-entered the town and spotted signs for a tourist office. 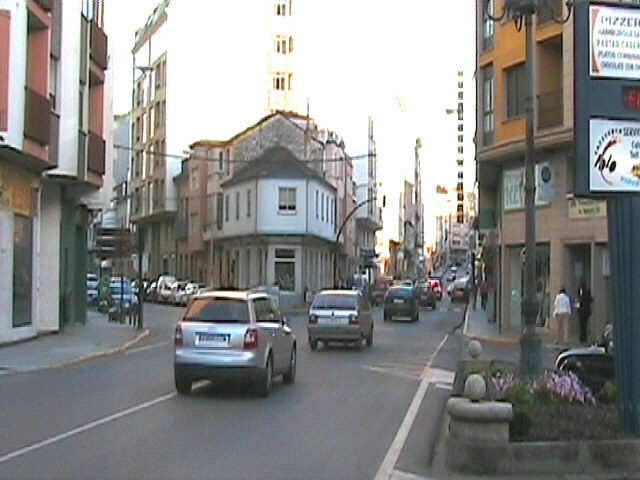 That seemed odd, as Sarria is no picturesque little Galician town (just look at the photos). In fact Sarria is a new town (by Galician standards) and was built in the nineteenth and twentieth centuries with little to offer in the way of history, a medieval quarter, or anything else for that matter. We followed the signs to the tourist information office but, surprise, surprise, it was closed. 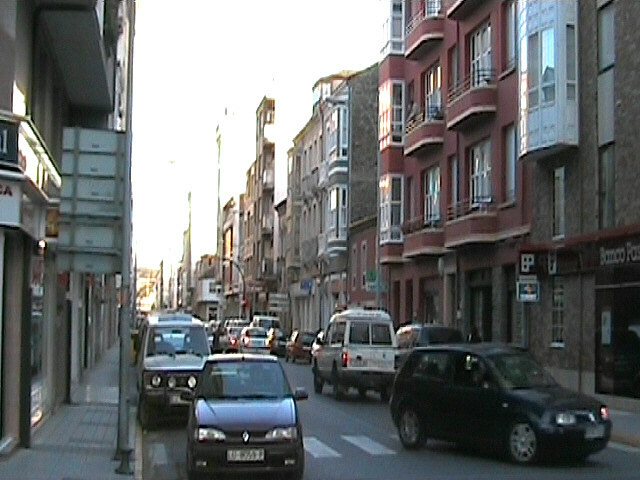 At that point, our interest in Sarria faded and our efforts focused on a hot meal and something to drink. 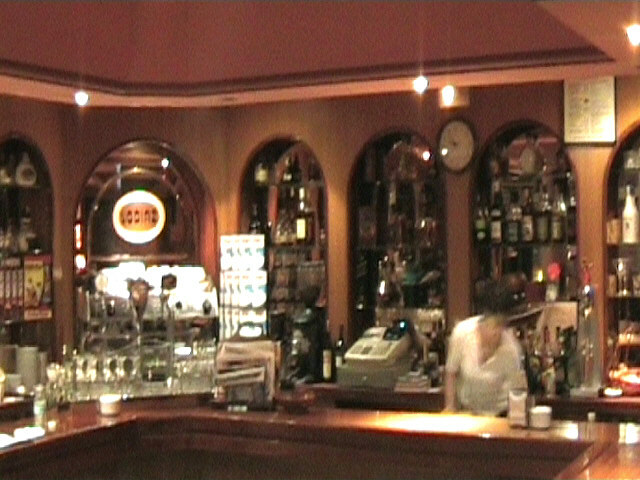 As we approached the bar and spoke, all eyes were upon us, I think we were the first foreigners ever to grace the place. Having taken our order the (very attractive) waitress disappeared in to the kitchen, following which two other bodies poked their heads around a door and took a look at us. Was this there big chance to put Sarria on the map and impress the English, or was it a look of distain? The pizza was excellent, as was the service and attitude of the staff, and I remember that meal like a starving man confronted with manor from heaven. Fed and watered, we departed Sarria and managed to get lost several times before reaching our accommodation in Noia (A Coruna province) at 2.00am in the morning. On leaving Sarria, now in the dark, we did however spot an illuminated tower (the earls of Sarria) on the hills above, which we subsequently discovered to be a monastery or convent. But, that's not Sarria's claim to fame either. What Sarria is actually famous for is antique fairs. Sarria is the antique capitol of Galicia and has a roaring trade in everything from furniture to art. In fact, on Galician TV the following night, there was an item on a French impressionist exhibition that had been taking place in Sarria at the time of our visit. Is that worth knowing? Well you decide, but at least you know something about a town in Galicia that hardly any non Spaniard will have heard of, or is ever likely to visit. Is Sarria worth a visit? Unless you use Sarria as a stop off point as we did, there is very little to see and do - unless of course you are looking for antiques or art. To return to the main Galicia home page, follow this link.